Helping Pet Adoption < Pound Dogs – screening now! Pound Dogs – screening now! Sometimes life imitates art, sometimes art imitates life. We’re excited about a new cartoon called Pound Dogs because it’s about – you guessed it, dogs in a pound. And although this art imitates life, it also adds some levity and humor to the world of homeless pets. 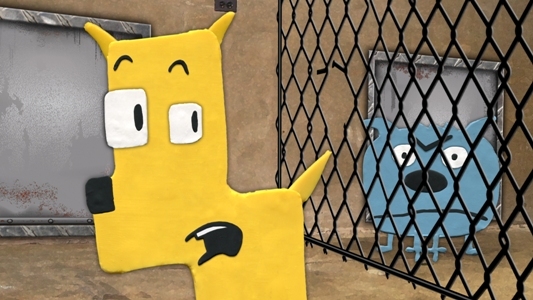 This animated comedy focuses on two unnamed dogs known only as “Blue Dog” and “Yellow Dog” who are stuck in an animal shelter and waiting to be adopted. It’s funny and heartfelt, but also honest. The stakes get a little higher when it is discovered that the Blue Dog is scheduled to be put to sleep at the end of the day if he doesn’t find a home. One of the things we love most about Pound Dogs is the conversation between Blue Dog and Yellow Dog. To pass the time, they discuss the trivialities of a dog’s life such as eating cat poop, which is bound to make the viewer chuckle. The hilarity continues as the dogs practice their special technique to relieve boredom: Blue Dog and Yellow Dog resort to rubbing their butts along the floor and wearing sombreros! But it’s not all fun and games as the dogs talk about desperately waiting for adoption at the animal shelter. All of the characters in the cartoon are animated with polymer clay, a process that ends with all the characters being baked in director Mike Salva’s oven before being scanned into the computer. To see a trailer of Pound Dogs click the play button below! POUND DOGS Trailer from Project Meatball on Vimeo. The 13-minute pilot episode is being screened at the New York Television Festival a potential series for Pound Dogs, so if you’re in the NYC area you might want to check it out! We at Adopt-a-Pet.com are happy to support projects like this one, out there making meaningful art with a pet adoption message! We wish Pound Dogs luck and hope it leads to many more pound dogs finding happy homes.